Jeff Broin doesn’t waver. Give him a problem, and he’ll tackle it head on. Most people look at our oil-based society and see it as status quo, a cemented fact. But Jeff Broin — the founder, chairman and CEO of POET — sees how biofuels provide limitless possibilities. Since its humble beginnings 30 years ago, Broin’s relentless vision and passion have led POET from a single-plant operation in Scotland, S.D., to what it is today: the world’s largest producer of biofuels, with 28 bioprocessing plants, a $6.5 billion revenue company, and a global leader in the production of renewable products. When Broin was living at the Scotland plant 30 years ago (he lived there for the first six months to rebuild and later manage the plant), he wasn’t concerned about changing the world. He was just trying to feed his family and keep his head up. It was a family business, and his wife, Tammie, played a role early on. She traveled with Jeff when he was buying equipment from different facilities and acted as secretary for several years. She remembers that he did what it took to get the job done. “Whenever he saw an opportunity or a challenge, he took it on. He just had perseverance,” Tammie says. Since that time, Broin’s vision has grown much larger from simply feeding his family to changing the world. Within the past 30 years, his ambition has expanded as he’s seen the potential of agriculture to produce food, fuel and fiber. That vision has led to groundbreaking achievements both at POET and abroad, guiding the company to be the world’s largest producer of biofuels and backing cellulosic biofuels endeavors and helping farmers across the globe better use the sun, soil and seed to feed their own families. Despite this success, Broin returns to the theme of gratitude often — gratitude to God for his family, the team members at POET and all those who have helped him along the way. His commitment remains steadfast. “We’re put on earth to make a difference. It’s very important for all of us to leave a better future for our children and grandchildren. I’d say that’s really what drives me,” Broin says. Biofuels have allowed many of these individuals to continue farming when they otherwise may have turned to other modes of income. As Broin reflects on the past 30 years, he’s quick to state that the work has been far from easy. POET has encountered challenges on several fronts, from raising capital for plant start-ups, to major challenges on the political front, to fighting misinformation from Big Oil. That’s one of the reasons he led the formation of the biofuels trade association Growth Energy in 2008 in order to ramp up initiatives to break through the Blend Wall. Lautt credits Broin’s vision and determination for launching efforts to move to E15. Broin’s leadership has been integral to the industry’s success, notes Steve Kirby, the former South Dakota Lt. Gov. governor who now is a founding partner of Bluestem Capital Company, a private equity firm and POET investor. Broin’s passion for what biofuels can do for the world continues to keep him at POET today. Colleagues reiterate that he lives and breathes the business. “For Jeff, this is not a job. It’s a lifestyle. He is just all in. I don’t ever see him stopping. He is just too much of a true believer to do anything but push for the benefit of biofuels,” says Doug Berven, Vice President of Corporate Affairs, POET. 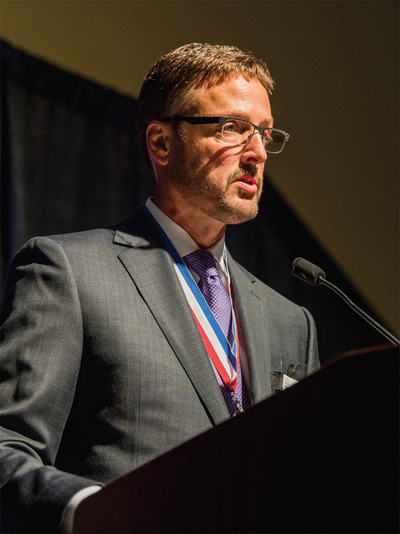 For Broin’s leadership , vision and achievements, he has been honored in 2017 with three prestigious awards: He was inducted into the 2017 South Dakota Hall of Fame, received an honorary doctorate from South Dakota State University, and was awarded the 10th annual George Washington Carver Award from Biotechnology Innovation Organization (BIO), a trade organization that represents the biotech industry worldwide. The vision for POET has always been ambitious. When Jeff Lautt interviewed with Broin 13 years ago, Lautt recalls, he said to him that the goal was to be the ExxonMobil of the biofuels industry. Broin’s philosophy has always been to be the best — and that goes back to his strong, Midwestern work ethic and that passion for what agriculture and bioprocessing can do for the world. Where other companies have been content with the status quo, POET’s team members have always wanted to do things better and bolder than before. That focus on refinement and improvement eventually led to the company’s vertically integrated business model, which is unique to POET in the industry. In the early years, the company operated the Scotland plant and was working with small farmer-owned cooperatives to establish bioprocessing plants. Broin then formed a management sector, now known as POET Plant Management. Additional divisions were formed in the coming years. This business model allows the company to do everything from producing and marketing biofuels and their coproducts to handling research and development and pioneering cellulosic biofuels. The mindset of reacting quickly and positively to change has led POET to continued success where others have faltered. POET has been designed and built to be a growth company, which reflects Broin’s personality. “We’ve weathered a lot of storms,” Lautt says. While many companies take a “if it’s not broke, don’t fix it” mentality, POET, steered by Broin’s entrepreneurial, visionary mindset, isn’t afraid to change the model and create something new. For example, the company recently formed POET Biorefining, or PBR, a merger of bioprocessing facilities that was overwhelmingly supported by investors, in reaction to comments from shareholders about increasing diversity and growing with the company. The new entity provides liquidity options for investors and new sources of capital for future acquisitions and expansions. “PBR gives us the flexibility to invest in new capital projects such as the recent Marion addition,” Broin noted. POET - Marion broke ground in August 2017 on an 80 million-gallon expansion. Again, risk has never deterred Broin from pursuing any challenges. POET has been working on cellulosic for over a decade now, and it is one of the company’s biggest investments. Project LIBERTY — the commercialscale cellulosic biofuels plant in Emmetsburg, Iowa — opened in 2014 and is a joint-venture partnership with global science company Royal DSM. From the start, the odds were highly stacked against this effort. One might say the pursuit of turning corn cobs, leaves and husks into fuel would even be a foolish pursuit. Feike Sijbesma, CEO of Royal DSM, credits Broin’s determination and commitment to help realize the first commercial-scale cellulosic bioprocessing facility in the world. But Broin’s vision goes farther — much, much farther. If you’ve been following POET long enough, you’ve probably heard the story of how when Broin first visited Kenya and saw the stunted corn, he had to do something about it. Some may have shrugged and walked away. Jeff and Tammie Broin and their three children, after visiting Africa together, formed a nonprofit — Seeds of Change — to support farmers in developing nations. “We sat around with the kids and decided to start a nonprofit together as a way to give back,” says Tammie. She’s heavily involved with Seeds of Change today. They most recently traveled to Kenya together in January 2017, visiting Travellers’ Oasis Centre (TOC), an all-girls school in Kenya, as well as checking in on Mission Grow, where they are helping farmers quadruple their yields within two years and be completely sustainable within four. “We’re helping Africa in ways where they have immediate need, but we’re also trying to make them sustainable by teaching them how to farm,” Broin says. The work in Africa is just getting started, and Broin is not content to the work being contained to Kenya. That Midwestern mindset — the passion, the work ethic, the drive — continues to fuel Broin and his vision for POET and for what biofuels can do for the world. Not surprisingly, he says that passion has worn off on his children as well. Daughter Alyssa works as her dad’s Chief of Staff. Younger daughter Miranda has worked on numerous writing projects and serves on the Seeds of Change Foundation board. Son Austin interned in Summer 2017 with Growth Energy and has worked at Project LIBERTY. Tammie isn’t surprised to see their children follow suit. And it’s important to her to see their kids give back to society. Broin stresses the importance he and Tammie put on teaching their children Midwestern values and raising them to work hard. “Our kids got their first checkbooks in fourth grade and had to work and manage their own finances, which is what happened to me when I was young. I think that was a good move. We made sure they never felt privileged, and they turned out humble. They have gratitude, and that’s simply what we tried to teach them,” he says. The mission — and vision — continues for Jeff Broin. For Broin, never content to rest on his laurels, the focus is on what’s next, and on the immense possibilities that biotechnology holds for the future. The exciting part for Broin — and for many others at POET — is to contemplate what’s in store for the next 30 years. The company will undoubtedly continue to expand its footprint in the biofuels arena by producing more starch gallons, growing in the cellulosic space, replacing other petroleum-based products and taking advantage of any other opportunities along the way. Whatever challenges may emerge, Broin is determined and will not be deterred by obstacles in his path. And Broin wouldn’t have it any other way.